Graduation 2012: Paper or Plastic? Perhaps thanks in large part to retreating pump prices, 2012’s fresh batch of high school and college students won’t be left out in the cold this year, at least when it comes to gifts [good luck with that frigid employment environment, though]. According to the latest insights we collected for the National Retail Federation, consumers are expected to spend more than $4.7 billion dollars on graduation gifts this year, eclipsing the $3.8-$3.9 billion totals we’ve witnessed for the past several years. That’s about $100 per gift-giver, a ten percent increase in spend over 2011 ($90.42), and an amount more in line with what we recorded before consumers felt the full force of the economic fall-out in late 2008. 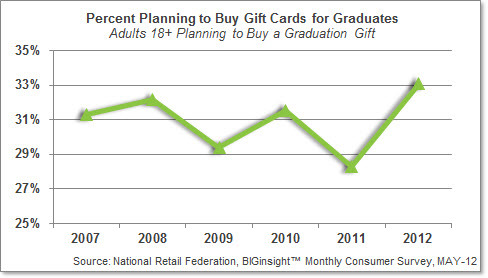 When it comes to bagging an actual gift, it looks like paper (cash) or plastic (gift cards) is in store for graduates. Nearly three out of five (57.6%) graduation gift givers are planning to congratulate with cash, which has remained relatively consistent over the course of this survey’s six year history. About a third of plan to reward graduates with gift cards (33.1%); this plastic payment seems to be enjoying a gifting renaissance for 2012, up 17% from the survey low set just a year ago (28.3%). With a wide variety of retailer gift cards available in many mainstream food and drug stores, convenience may be tied to gift cards’ surge in popularity; however, perhaps it’s also attributable to rewards sometimes tied to gift card buying (gas or food discounts, the ability to purchase with credit card rewards, etc.) – a win, win for both the buyer and the recipient, right? 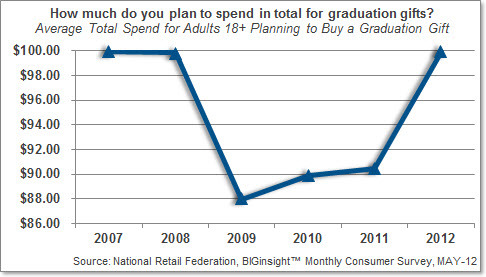 For more on Graduation 2012, view the National Retail Federation’s post: Graduation gift giving to top $4.7 billion in 2012. 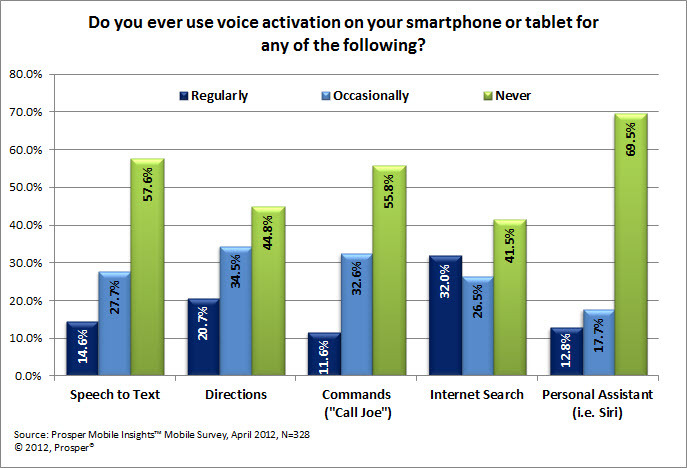 Mobile Users Speak…to their devices! Do you ever find yourself driving down the highway, asking your smartphone for directions to a restaurant or a friend’s house? 3 in 4 Mobile Users say they utilize at least some form of voice activation on their smartphones or tablets, for a variety of uses from commands (“Call Mom”) to personal assistants (“Siri, what restaurants are nearby?”), according to the latest mobile survey from Prosper Mobile Insights. Among the 74.4% who use voice activation at least occasionally, most (63.1%) are somewhat or very satisfied with the voice capabilities on their mobile devices. However, about a fourth of this group (23.8%) is neutral—they are neither satisfied nor dissatisfied. Perhaps these folks just haven’t used voice activation to the fullest? Maybe they’ve read too many autocorrect mishaps? Or maybe other smartphone and tablet features are just more alluring. Mobile Users say texting, Internet access, calling and email are the top features they can’t live without, along with GPS and of course, apps. This month, my co-host for the BIG Call was Dianne Kremer, Senior Analyst for BIGinsight. Dianne is also the editor of Prosper China’s Quarterly Briefings on Chinese Consumers and is a frequency quoted expert on our American Pulse insights. – Practicality, Focus on Necessities declined from April…so was May’s “dip” in Confidence a short-term “blip” or are consumers having a sluggish spending response to sagging sentiment? For the full, complimentary May 2012 BIG Call slide deck, please click here. The arrival of Spring each year seems to provide a lot of us with the kick in the pants we need to get things done around the house. Maybe it’s the warmer weather. Or the birds chirping – you know, Whistle While You Work and all of that Disney folderol that’s been ingrained in us. (Side note: I’m still looking for a few [cartoon] birds and squirrels to help me with the chores à la Snow White). Anyone motivated by the smell of the fresh-off-the-farm mulch? Much to the chagrin of my husband, it puts me in the mood to buy LOTS of new annuals. At any rate, Spring just seems ripe for DIY. The problem for many of us, though, is that there aren’t enough hours in the day (…weeks…months…years?) to make all of our DIY wishes come true. And let’s face it, we’re still waiting on our fairy godmothers to grant that ultimate request – the means to hire out all of this work and have it done before retirement. 1. 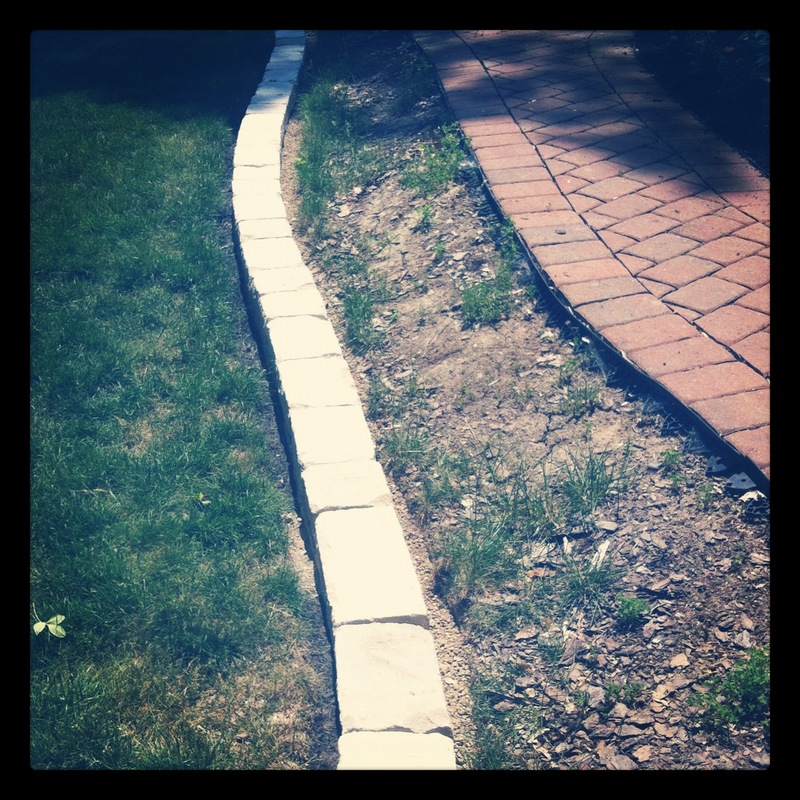 A retaining wall along our front walk. My genie husband is hard at work on this as I type – I guess dreams do come true! 3. A remodeled master bath. The layout is just strange, and every gal deserves a spa tub, right? 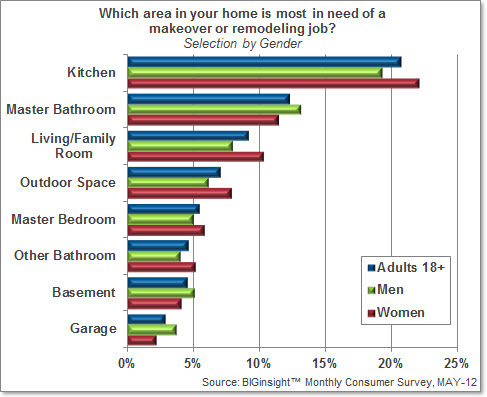 For our May Consumer survey, we [quasi] granted our nearly 9,000 respondents with one makeover wish for their homes. While Master Bathrooms (12.2%) and Outdoor Spaces (7.0%) made the Top 5, one in five consumers (20.7%) agreed that a Kitchen remodel is at the top of their “To Do” lists. Living/Family Rooms (9.2%) and Master Bedrooms (5.4%) were also high priority. And, more men set precedence on their Basements (5.1%) compared to average; must be all of those unfinished Man Caves [insert chest thump here]. Now where are we drawing inspiration for our fabulous new spaces? Magazines (43.7%) and Television (33.6%) are the top culprits idea starters, followed by Instore/Showroom Browsing (26.8%), Online Searches (24.8%), and HGTV (20.7%). The popular cable channel was even a Top 5 pick for Men – but we’re probably talking more Holmes on Homes here and less Sarah’s House…probably. Somewhat surprisingly, Social Media (Facebook, Pinterest, etc.) piques the inspiration of just 6.6% of consumers, only slightly ahead of one-time domestic maven Martha Stewart (5.0%). 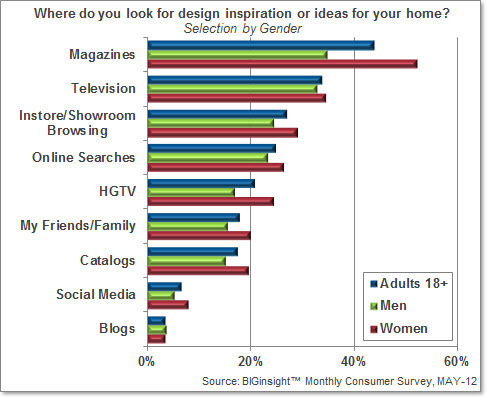 Blogs fared worse, with just 3.6% following for DIY ideas [though this blog changed my life]. Earlier this month, the Energy Information Administration (EIA) significantly downgraded the forecast for summer (April through September) pump prices by 16 cents per gallon to $3.79. With the EIA changing their expectations for the summer, are consumers doing the same? Will the pain at the pump impact Memorial Day? And how do gas price expectations impact consumer behavior? Let’s start with the upcoming holiday weekend. 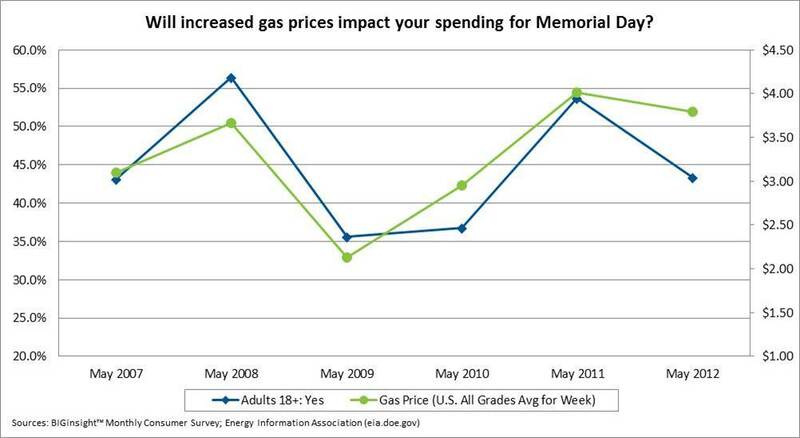 Less than half (43.3%) of Adults 18+ indicated that increased gas prices will impact their spending for Memorial Day, down more than 10 points from last year (53.7%) when gas prices were more than 30 cents higher on average. This is on par with May of 2007 (43.2%) when gas prices were $3.10 on average and below May of 2008 (56.4%) when prices were $3.66 per gallon. What a difference a few years can make; $3.10 per gallon would feel like a clearance sale at this point. Note: The EIA gas price data is from the first week of each month which corresponds with the timing of the survey collection. What do consumers expect prices to be by the time the holiday weekend has passed? 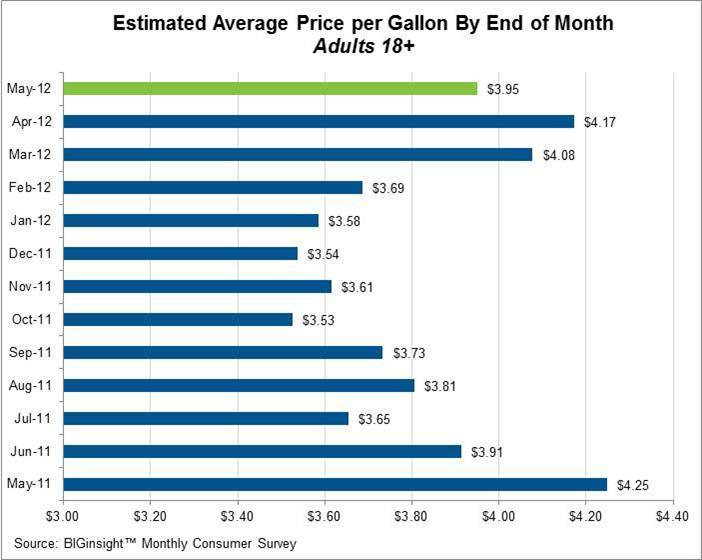 On average, Adults 18+ anticipate that prices will be $3.95 by the end of May. Consumers have lowered their expectations after an increase in April ($4.17). While this is still above the $3.79 average expectation the EIA recently released, it’s important to note that they announced their new forecast on May 8, 2012, the same day we completed fielding the Monthly Survey. Stay tuned for June to find out if consumer expectations continue to lower and if these decreasing pump price forecasts help boost their confidence in the economy after it fizzled in May. Why all this talk about expectations for gas prices? Do they really matter? In the April BIG Call, we learned that the answer is yes. When gas prices exceed consumer expectations, they make changes quickly. The chart below shows the percentage of consumers who said they are driving less because of gas prices compared to actual gas prices. From February to March of 2012, we see a more than ten point jump in those who are thinking twice before putting their foot on the gas pedal. While there was a 30 cent upswing in the average gas price during this time, the percentage who were driving less remained flat from March to April when prices increased 15 cents per gallon. Wouldn’t we expect to see some sort of increase in consumers driving less often in April if the 30 cent upswing in March had such a dramatic effect? After taking a closer look, we came across a BIG insight. The differentiating factor from February to March is that gas prices exceeded consumer expectations. In February, consumers had only expected gas prices to be $3.69 per gallon by the end of the month. By the first week of March, they were at $3.85 per gallon. So, the consumer expectation was below the actual gas price. In March, consumers had an expectation of $4.08 per gallon by the end of the month and prices were only $4 per gallon by the first week of April. The expectation was higher than the actual price. *The actual gas price data is from the first week of the following month. To keep a pulse on how gas prices and other economic issues are impacting consumers, sign up for the Consumer Vital Signs InsightCenter™. Is there something in that Two-Buck Chuck? 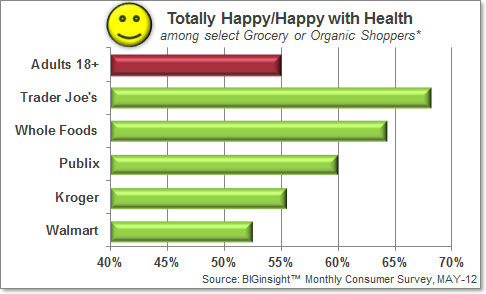 New BIGinsight™ analysis reveals that Trader Joe’s and Whole Foods shoppers* are happier with their health** compared to mainstream grocery shoppers at Kroger, Publix, and the nation’s top pantry supplier – Walmart. While Publix shoppers trail the likes of Whole Foods and Trader Joe’s in terms of health happiness, customers at this grocer – known for its quality assortment of items ‘round the perimeter – track ahead of both Kroger and Walmart. On the flip side, nearly a quarter (23.1%) of Walmart shoppers feels “unhappy” or “totally unhappy” with the state of their health. 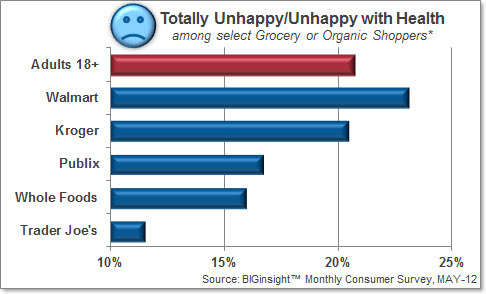 Kroger shoppers aren’t far behind with this sad-faced sentiment (20.5%), while far fewer (11.5%) Trader Joe’s shoppers are worried about their well-being. Interestingly, shoppers with a proclivity toward natural and organic goods aren’t prone to shunning that fast food guilty pleasure. In fact, nearly half of Whole Foods’ customers (45.6%) patronize a fast food restaurant once a week or more often, higher than the overall average (39.0%) as well as – surprise! – Walmart shoppers (44.1%). Trader Joe’s (43.3%), Kroger (46.7%), and Publix (42.0%) each index above the national rate as well. But it’s all about the choices we make though, right? While McDonald’s is the preferred fast food restaurant across all of our shopper groups [gotta love those fries], Subway – with its arguably fresher/healthier menu – indexes higher among Whole Foods and Trader Joe’s customers. In addition, these organically-minded shoppers place more importance on a quick service restaurant’s healthy menu options and food quality than average, while Walmart patrons are more apt to opt for lower pricing and a value menu. Finally, it’s evident that Whole Foods and Trader Joe’s shoppers aren’t achieving health satisfaction without any effort. Nearly ninety percent of each of these customer groups report doing something about their health, such as watching calorie or fat intake, exercising regularly, or opting for more organic foods. 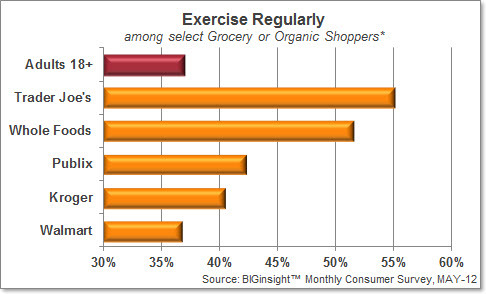 Working up a sweat is key; in fact, Trader Joe’s shoppers are 50% more likely to hit the gym compared Walmart customers. More than a quarter of those bagging their groceries at the big discounter (27.5%) say they don’t do anything with regard to their health, the highest of all the groups analyzed for this report. This post was inspired by our original analysis of Fast Food customers’ health happiness: One in Four McDonald’s Customers Unhappy with Their Health. * Whole Foods, Trader Joe’s, Kroger, Publix, and Walmart shoppers were analyzed for this report. Whole Foods and Trader Joe’s “shoppers” are defined as respondents who indicated that they shop these retailers most often for Organic Products (an unaided, write-in response). Kroger, Publix, and Walmart “shoppers” are defined as respondents who indicated that they shop these retailers most often for Groceries (first or second choice), also unaided, write-in responses. Shopper groups analyzed in this report are not mutually exclusive. ** Respondents were posed with this question: On a scale of 1-5 with 1 being “Totally Unhappy,” and 5 being “Totally Happy,” how would you rate your happiness level with your Health? When we last took a spin in our monthly auto data, we found that Subaru owners were the most likely to recommend their vehicles to friends and family. While that’s still true of the 18 vehicle nameplates* we analyzed for this new report, we thought it would be interesting to add some new faces to the mix – and analyze this data by each automaker’s country of origin. Before we begin today’s tour, though, let’s review some of the details. By applying the Net Promoter Score (NPS)** metrics system to our May Consumer Survey data, we can see which drivers (i.e. Ford owners, Toyota owners, etc.) are buzzing about their current cars as well as which think their autos are wrecks. For this new analysis, we took the percentage of a nameplate’s detractors and subtracted them from the number of those who actively promote their current automaker, which helps us evaluate the strength of a brand’s image. 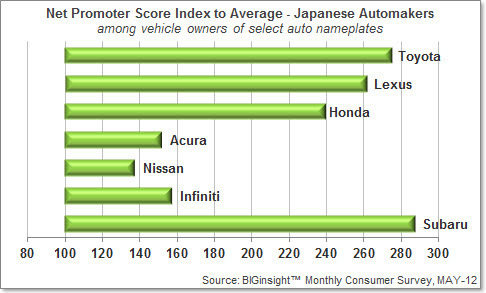 We then took these scores and indexed them to the national average of ALL vehicle owners, +18.5%. Please note that all graphics are based on the Net Promoter Score Index, where an index of 100 = average. When one thinks of the European nameplates hailing from this country, the words quality and/or luxury may come to mind…that is, unless you ask a few BMW owners. 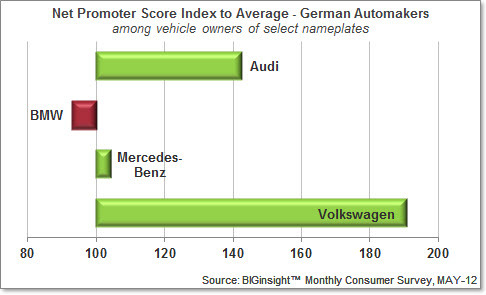 While each of the German automakers we took a look at (BMW, Mercedes-Benz, Audi, Volkswagen) scored a positive Net Promoter Score, BMW’s rating was the only one to fall below the national average for all vehicle owners (index = 93). The force is definitely with Volkswagen in this grouping [still loving that Super Bowl commercial], where the automaker secures a NPS which nearly doubles that of the overall average (index = 191). In general, drivers seem to have love-hate relationships with the BIG 3. On one hand, it’d be great to “buy American,” but on the other, these automakers have been plagued by bankruptcies, inflated prices, as well as safety and quality issues [insert any number of vehicular anagrams here]. Among some of the U.S.-based nameplates, though, we can find a ray of light; Net Promoter Scores for both Cadillac and Ford index above average. 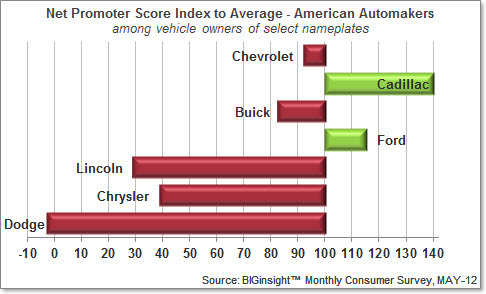 Unfortunately, Chevrolet, Buick, Lincoln, Chrysler, and Dodge suffer from below average ratings. 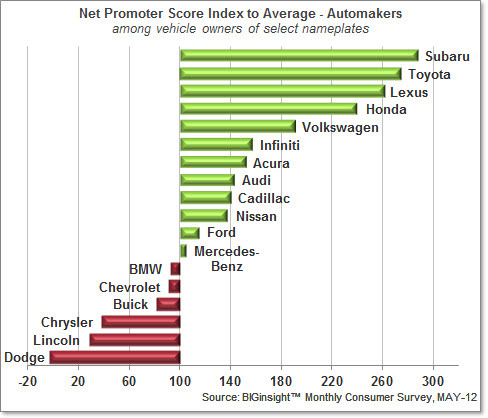 In fact, out of the 18 nameplates we analyzed for this blog, Dodge was the lone automaker suffering from a negative Net Promoter Score (NPS = -0.6%), which means its detractors slightly outweighed its promoters. Lincoln and Chrysler just barely eked out positive ratings with 5.3% and 7.1% Net Promoter Scores, respectively. So while the Detroit automakers are working on turnarounds, it does seem that they continue to be hindered by Americans’ perceptions of their vehicles. All told, it’s evident that the BIG 3 still have A LOT of work to do when it comes to improving their brand image with consumers, which is key because we’re the ones ultimately doing the buying, right? *Select Currently Owned Vehicle Nameplates (Audi, BMW, Mercedes-Benz, Volkswagen, Chevrolet, Cadillac, Buick, Ford, Lincoln, Chrysler, Dodge, Toyota, Lexus, Honda, Acura, Nissan, Infiniti, Subaru) were analyzed for this blog. Respondent counts for each nameplate ranged from N = 42 to N = 1085. The NPS which takes a simple question–Would you recommend us to a friend?–has helped countless organizations better understand “promoters” and “detractors” and paint a clear picture of their company’s performance through the eyes of their customers. By applying the Net Promoter Score*, executives can identify their customer base and move beyond “sufficient” to brand loyalty and growth.